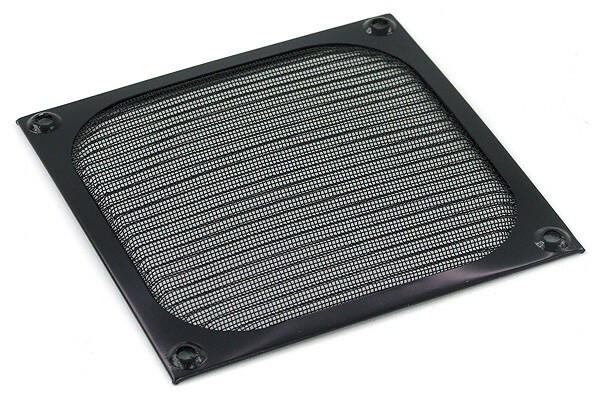 With this visually appealing metal air filter you can finally be free of annoying dust. The filter is simply screwed onto the corresponding 120mm fan. This effectively prevents dust from collecting in the case interior. The airflow from the fan is only minimally hindered by the coarse weave of the metal mesh. The filter is easily washable and thereby always reusable. The best visual impression is made by the black filters, so we stock them in greater quantity than other colours. If other colours are not in stock, they can be ordered and made available on short notice. Also ich habe erst jetzt wieder 2 Stück für die Rückseite meines in der Front eingebauten Radiators benutzt, um auf der Rückseite eine bessere Optik zu erzielen, weil mein Radiator von Alphacool nur einseitig lackiert wird und diese Optik mir nicht gefallen hat. Jetzt sieht es wieder Klasse aus. Schade das man hier keine Fotos posten kann.